Musk: "We must at some point achieve a sustainable energy economy or we will run out of fossil fuels to burn and civilization will collapse." Tesla Motors CEO Elon Musk on Wednesday unveiled an ambitious plan to expand the company into electric semi trucks and buses, car sharing and solar energy systems. In a blog post titled "Master Plan, Part Deux," Musk sketched a vision of an integrated carbon-free energy enterprise offering a wider range of vehicles, and products and services beyond electric cars and batteries. He restated his argument that Tesla should acquire and integrate the operations of solar panel installer SolarCity Corp, where Musk is chairman and a major shareholder. The plan did not detail how new projects such as electric trucks or public transit vehicles would be financed. Both Tesla and SolarCity are burning cash. Tesla in May sold about $1.7 billion in new shares, indicating much of that will be used to accelerate development of its new Model 3 car lineup and reach a production pace of 500,000 vehicles a year by 2018, two years ahead of an earlier plan. "In cities where demand exceeds the supply of customer-owned cars, Tesla will operate its own fleet, ensuring you can always hail a ride from us no matter where you are," he said. Such a service would put Tesla in competition with ride-hailing services such as Uber or Lyft. Musk said all future Tesla products will have fully self-driving capability, including trucks and buses, which he said would be unveiled next year. Most major automakers, as well as internet search company Alphabet Inc., are investing heavily in automated driving technology. Daimler AG is working on automated heavy trucks and electric commercial vehicles. General Motors and Toyota Motor Corp. are among the auto companies working on car sharing and forging alliances with ride-hailing companies such Lyft and Uber to break into the growing market for services built around vehicles. On June 21, Musk proposed that Tesla buy SolarCity. 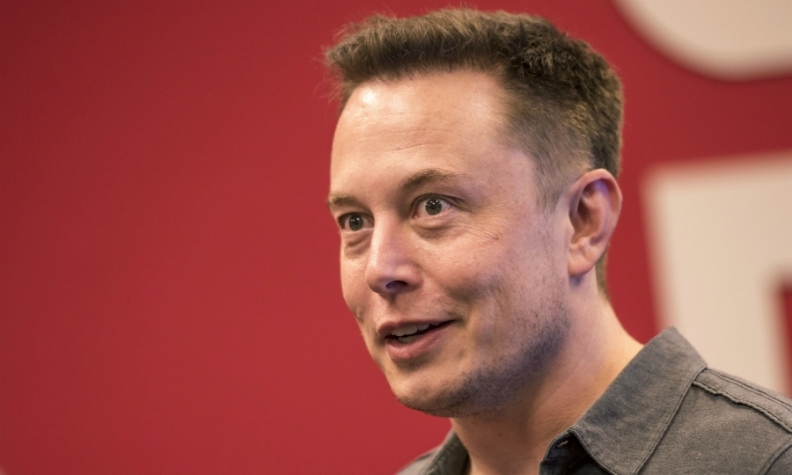 He outlined a combined company that could provide consumers with the tools for a largely carbon-free lifestyle -- electric cars recharged with electricity generated by SolarCity solar panel systems, or stored in the home using battery packs produced by Tesla's battery Gigafactory under construction near Reno, Nev.
Musk owns 22 percent of SolarCity's shares, and has outlined plans to offer buyers of Tesla electric vehicles a solar power generation and battery storage system. Tesla on June 22 filed applications to use the Tesla name for solar energy systems and services, such as monitoring solar panels. Tesla faces challenges on other fronts. The National Highway Traffic Safety Administration is investigating the safety of the Autopilot system that allows Tesla vehicles to guide themselves on a highway with the driver's hands off the wheel for extended periods. The NHTSA probe followed a May 7 crash in which the driver of a Tesla Model S was killed when the car drove under a tractor trailer on a Florida highway. Musk said in a tweet earlier this week that Tesla is working with Robert Bosch GmbH on improvements to the Autopilot system's radar sensors.